I receive a lot of questions about getting out of the market before the next economic recession or stock bear market. For many investors there is a constant fear that they will be too late to get out of stocks when the market starts into a deep decline, and much of their portfolio values will evaporate. Events of the last few months show how quickly sentiment and prices can swing in the stock market. There are also plenty of investment service providers that feed on those fears with their marketing programs. I have watched and participated in the stock market for almost 40 years. That time has shown me that it is nearly impossible to predict when a small stock market correction is the one that turns into a deep bear market. Jumping out of stocks at the start of every correction will just cause an investor to lose money and not participate in the next up leg for share prices. The near impossible task of timing market tops and the next bear market is one of the primary reasons I focus on dividend paying stocks. Quality dividend companies will continue to pay through a recession and bear market, and history shows that dividend payers are among the first to recover following a steep market decline. My strategy is to be an owner of dividend paying stocks through the ups and downs and backups of the market. When share prices drop, I will buy more, boosting my dividend earnings and average yield. However, some stocks are more defensive than others. If you see something that tells you a bear market is coming, one strategy is to sell your riskier high-yield stocks and shift your capital into more conservative dividend stocks. These are companies with rock solid balance sheets, and businesses that will continue to operate well right through any recession. In a deep bear market, share prices of all stocks will go down, but these are the ones that you can confidently accumulate during the decline and boost your profits and income when the market recovers. 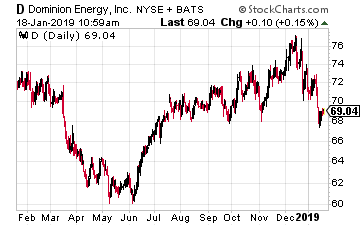 Dominion Energy Inc (NYSE: D) is a $52 billion market cap utility company serving the mid-Atlantic states. The company is vertically integrated to provide both natural gas and electric power to customers. Dominion Energy is a growth focused utility. The company plans to spend about $4 billion per year on growth projects, which will help grow earnings per share by 5% to 6% per year for the foreseeable future.